As the new year approaches, it’s time to come up with great new innovative ideas to help move your business forward. Not everyone has the luxury of large open conference rooms, so we are here to help you come up with a great idea for this space. Here at Decor8 Hong Kong furniture, we are proud to present our Prima Foldable Office Conference Table and Work Desk. So what makes this table so special? The Prima Foldable Table works best in a fast-paced ever changing environment. The days of an intimidating stationery conference table in the middle of a room can be quite obstructive. You can create an intimate setting to cater for any group sessions with these reconfigurable foldable conference tables. This gives you the option to expand when more guests are present. 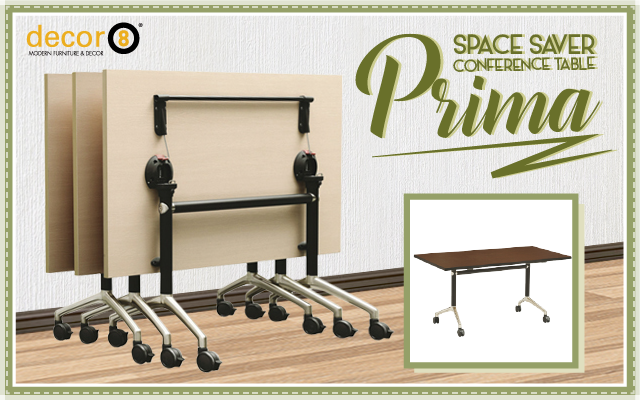 Another great feature of the Prima Foldable Conference Table is their ability to nest into each other for storage. Great feature for saving space when it is time to move them and store them away. As we point out moving them around, this becomes a lot easier with their built in wheels. With the ability to move around, you can move them into any configuration, into a different room or even a different building with ease. The tops of the Prima Foldable Conference Table folds down and clips into place with two quality built locking mechanisms. The table tops come in the classic office style veneer finishes, which are available in light ash, dark walnut, black or white finish. The Prima Foldable Table is a space saver conference table that should be considered if you want to optimise the workspace. You can even consider stackable chairs to help save even more space. Check out our vast collection of office furniture to help you create a stylish modern office that you can be proud to work in. This entry was posted in Conference Tables & Meeting Tables, Tables and tagged conference tables, dining tables, foldable tables, large tables, meeting room furniture, meeting tables hong kong, modern design hong kong, office furniture, office tables.